Officially, the Great Recession of 2007 ended in June 2009. Yet the economic downturn remains in full effect for millions of Americans, particularly the nearly 40 percent of the unemployed who have been looking for work for six months or more. Original post at Mother Jones. In less than a week, emergency federal unemployment benefits for 1.3 million of these jobless Americans are set to run out. Proponents of ending the benefits argue that the economy is expanding and that the benefits prevent people from finding work. “You get out of a recession by encouraging employment not encouraging unemployment,” according to Sen. Rand Paul (R-Ky.), who opposes extending benefits. However, the data shows that while corporate America has bounced back, it is not restoring all the jobs it shed when the economy tanked five years ago. Currently, nearly 11 million Americans are unemployed. The unemployment rate stands at 7 percent. Both of those stats are improvements from a little more than four years ago, when the post-recession jobless rate peaked at 10 percent and more than 15 million people were out of work. 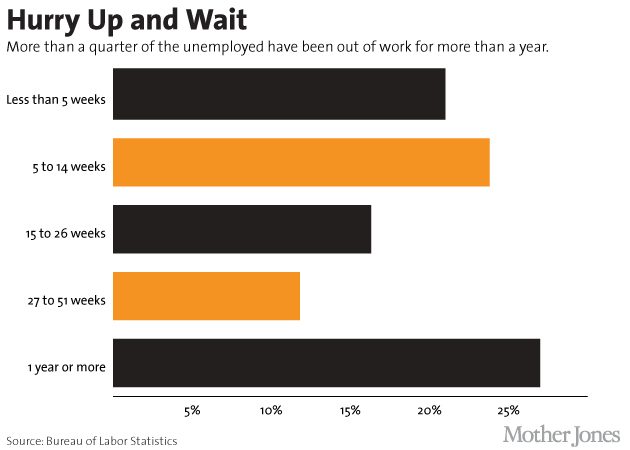 However, there currently are more than 4 million Americans who have been unemployed for six months or longer. 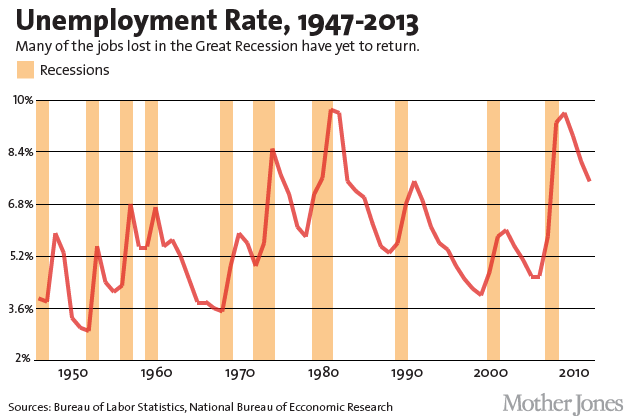 Not since the Great Depression has the United States experienced such massive and persistent long-term unemployment. Overall, the long-term unemployed (those with out a job for six months or longer) make up nearly 40 percent of all the jobless. 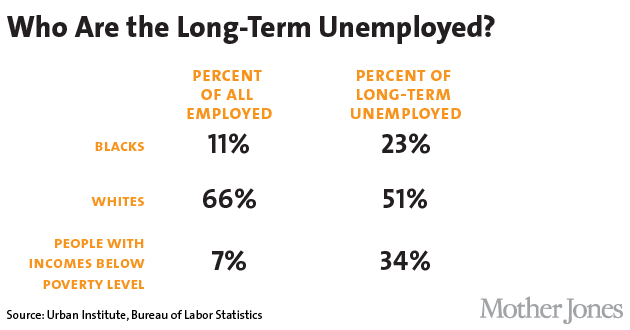 Long-term unemployment has not affected all Americans evenly. African-Americans and the poor make up 23 percent and 34 percent of the ranks of the long-term unemployed, respectively. 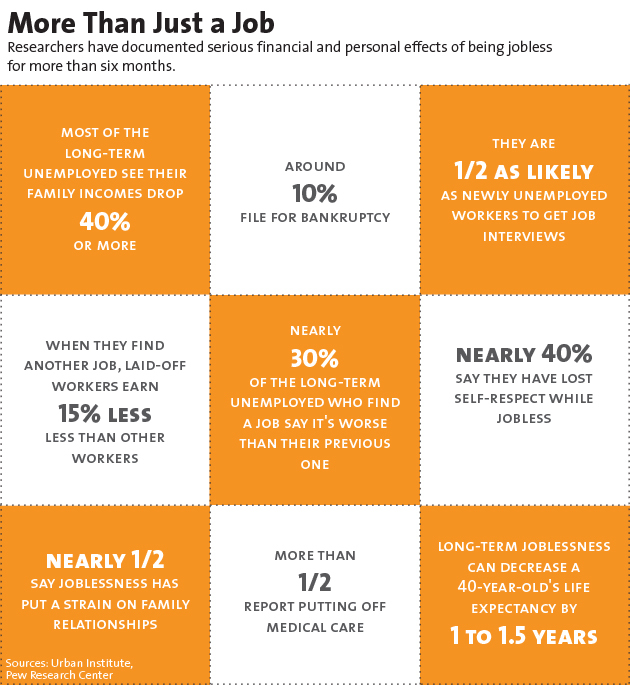 For many people, going without work for more than six months can kick off a vicious cycleor financial and personal crises that may take years to break out of. While the unemployment rate is steadily falling, hiring has not recovered as quickly as it did during the three most recent previous recessions. Currently, there are about three people looking for work for every job opening. 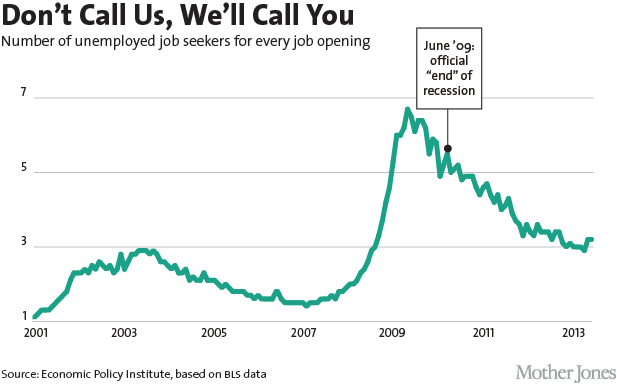 Compare this to 2007, when “job seekers ratio” was nearly half that. The ratio varies widely across industries, but even in the most applicant-friendly industry, insurance and finance, has 30 percent more seekers than positions. Meanwhile, corporate America has regained the financial ground it lost during the Great Recession. 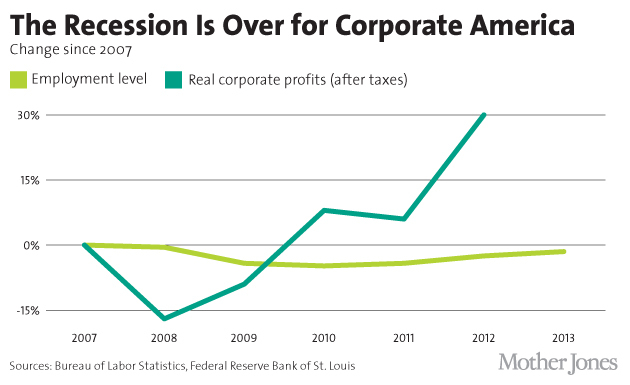 Real corporate profits after taxes have grown 30 percent since 2007, while the number of jobs is still below its pre-recession level. And the price of continuing long-term unemployment isn’t just borne by the jobless and their families. It’s dragging down the entire economy—to the tune of $1 trillion a year.